When the Policia Judiciaria suggested that the apartment where Maddie had disappeared from might be contaminated, due to the responsibility of the parents themselves, who failed to immediately contact the authorities, thus allowing for several persons to enter the bedroom, the McCanns set the British diplomacy in action to "take care" of the matter. "How does anyone dare to insinuate that our daughter's life may be in danger because of us?!" Kate writes in her notes dated June 17, showing she is "very angry". The McCanns didn't lose any time. "Gerry took the matter up". Madeleine's parents only needed to "call the ambassador" and a few hours later they had the guarantee that "the Portuguese police are going to publish a statement to clarify what was said". "Olegario de Sousa was very embarrassed", Kate writes in her notes, after the couple stated that they were "prepared to do whatever is necessary" if the police didn't clarify Kate and Gerry's role in the investigation. Three days later, Kate writes that Olegario de Sousa needed to "wisen up" and reveals that she feels they are "going nowhere". The "frustration" with the PJ starts being registered by Kate right after her daughter's disappearance. After an alleged sighting of Maddie in Morocco, on the 11th of May, Kate accuses the PJ of not having acted swiftly enough and of not doing everything that they can, given the fact that when they arrive in Marrakesh there are only images of the garage from the 14th onwards. "If the authorities had acted swiftly, we would now hold this potentially important information. She deserves better. We need everyone involved to give their best", Maddie's mother criticises. One of the criticisms that is launched by Goncalo Amaral in the book "Maddie, The Truth of the Lie", was the contamination of the apartment. The alert to the authorities was given very late and the GNR didn't protect the collection of the first residues, either. When the PJ arrived at the house, everything had already been rummaged. There were hundreds of fingerprints spread all over the apartment, tens of useless residues that only made the lab technicians waste time. One detail was, however, retained by the investigators. The bed where Maddie had allegedly been abducted from remained intact. The child's soft toy was also impeccably placed next to the pillow, in a scenario that seemed to have been set up. On the window through which Kate says the abductor took Maddie, there were only her own fingerprints. Goncalo Amaral, the coordinator of the Maddie case during the first five months, who never believed in the abduction theory, was harshly attacked by the English press – which is controlled and manipulated by the McCanns. The former Judiciaria inspector, who retired after a career of 17 years and published his theory about the disappearance of Maddie in a book, was removed from the case on the 2nd of October, the day of his 48th birthday. When the investigation quit being focused on abduction, after the first DNA results and the action of the forensics dogs, Goncalo Amaral was accused of being a "drunk". The English tabloids, even the more temperate 'The Times', wrote that the Portuguese inspectors at the Policia Judiciaria, [who were] responsible for the investigation into the disappearance of Madeleine McCann, had two hour lunch breaks, during which they ingested alcoholic drinks. Apart from the "well watered" meals, the British journalists accused Goncalo Amaral of working only four hours per day. The case which revealed itself as less of an investigation than a political and diplomatic process, ended up hastening the retirement of Goncalo Amaral, who reports the pressures that he suffered, in the book 'Maddie, the Truth of the Lie'. The former coordinator of the process remains convinced that Madeleine McCann accidentally died on the evening of the 3rd of May, in the Ocean Club apartment where she was on holiday. 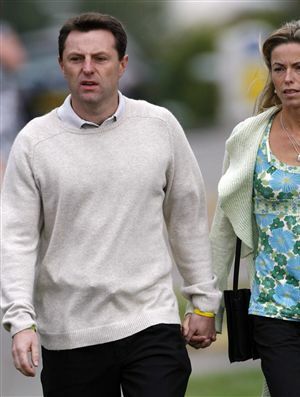 The McCanns controlled the English press – which constantly attacked the Portuguese police – in order not to become the target of unfavourable news, and in exchange offered previously arranged photo shoots. This is admitted by Kate in her notebooks, namely on June 15, when she arranged "a photo shoot on the way to the church to pacify them". The editor of 'The Sun' newspaper guaranteed to Kate, on the 11th of July, that there would be no "adverse publicity". "She was really nice. Perfect solution", Kate concluded. Tomorrow: How Kate managed the relationship with the twins.